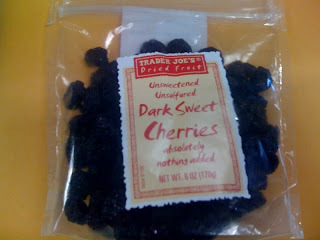 If we @traderjoeslist had a doppelganger, it'd be Dark Sweet Cherries--totally natural, totally yummy! Ingredients! Generally if you can't spell it or it takes you longer to read the list of ingredients then it actually takes to eat the product, DON'T put it in your body. That's why Trader Joe's Dark Sweet Cherries are so amazing. Not only do they help provide your daily fruit requirements in accordance with the ancient food pyramid, but these cherries are a tasty sweet treat! The best part, is there are no additives, no sugar, no sulfur, nothing! And since these sweeties have some fiber, they work great as an afternoon snack to keep the hunger pains at bay! Call me skinny, or call me sweet these dark sweet cherries make the perfect treat! I don't believe the label. Cherries have no fat, yet these do.